Montreal Canadiens goaltender Carey Price revealed Saturday that he will not require surgery for the lower-body injury he sustained early in the Eastern Conference final. Montreal Canadiens goaltender Carey Price said Saturday that he doesn't need surgery for the lower-body injury he sustained in the Eastern Conference final. 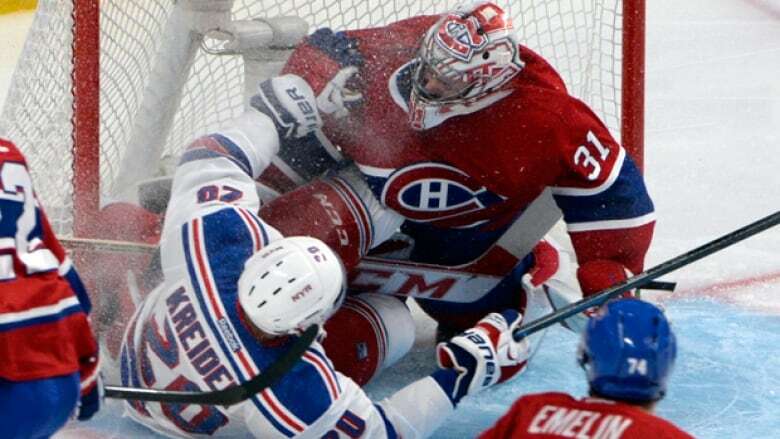 Price's playoffs ended in the second period of the series opener, when New York Rangers forward Chris Krieder crashed into him on a breakaway. Price would only call it a lower-body injury, although he was wearing a brace on his right knee in the days after the injury. "Over time, it's going to get back to normal," Price said. "I actually got really lucky. "It could have been a lot worse than it was." New York won the series, 4-2 to advance to the Stanley Cup final.